An implement warning light harness with a turn-signal module for two amber and two red lights are included as standard equipment for safe transport on roads. The rigid and TruPosition™ standards require engine horsepower of 6 hp per ft to 10 hp per ft. The Tru-Depth™ standard requires engine horsepower of 6 hp per ft to 14 hp per ft. 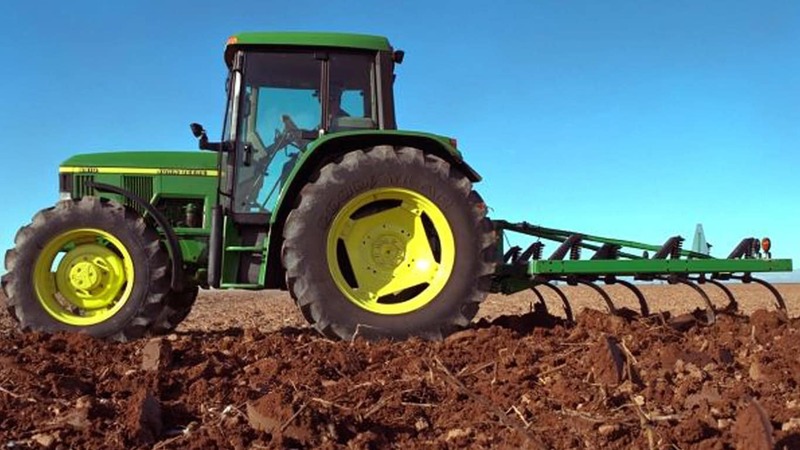 The 610 Chisel Plow is available in a variety of sizes to help match tractor horsepower and work designs. *Non-fragile residue includes crops like corn, sorghum, wheat (more than 45 bu). **Fragile residue includes crops like soybeans, edible beans, peas, wheat (under 45 bu), sunflower, peanuts, cotton. The 610 Chisel Plow features a large 102-mm x 102-mm (4-in. x 4-in.) tubular steel mainframe. Welded construction adds the inner strength that withstands twisting and pulling through demanding field conditions. A 102-mm (4-in.) diameter container provides storage to give the operator easy access to the manual at the front of the machine. It is made out of a durable polyethylene and will keep the manual clean and dry in all weather conditions. The container was designed exclusively for John Deere and the John Deere logo is shown on the lid. 9, 10 to 19, 7 ft, in. Tubing 4 x 4 high strength, box beam steel cross members, 2 x 4 steel end tubes, welded construction in. Underframe clearance Rigid and TruPosition- 28, Tru-Depth - 32 in.